The University of Maryland School of Medicine’s departments, divisions, centers, institutes, and programs are committed to groundbreaking research and exemplary education for School of Medicine patients and students. With support from generous donors like you, we’re able to discover new solutions and forge new pathways, helping to improve access for the underserved, reduce and eliminate health disparities, and deliver health education to those in need — in Maryland and throughout the world. 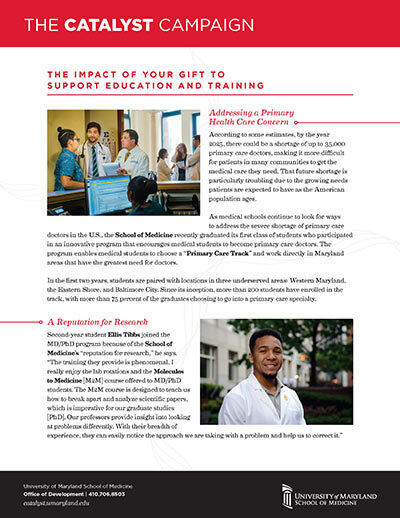 Your gifts to the Catalyst Campaign will support new teaching philosophies and educational “products” focused on training innovators and discoverers; continue to build our technology capacity to support on and off-campus activities; strengthen our internal mentorship program; and train the next generation of the medical/biomedical workforce. Now, more than ever, we need your help to continue to provide the education and training resources, innovative tools, and broad perspectives that today’s medical students need to prepare for a dynamic and challenging health care environment.